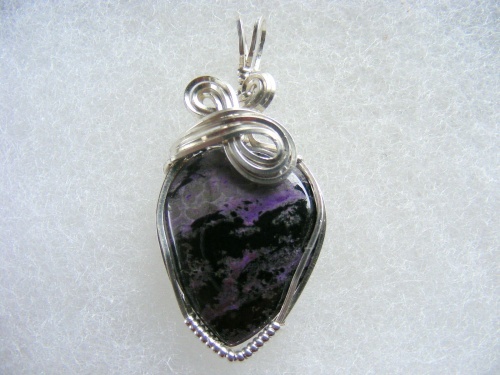 This beautiful Charoite gemstone is striking with the black veined and deep purple colors running through it. Teardrop shaped with swirls and curls of sterling silver. Piece measures 1 1/2" from top of bail to bottom of stone with 3/4" in width. Comes with a sterling silver chain. Chariote is the stone of transformation, the soul stone that helps overcome fears.